Synopsis (from Goodreads): Six years ago, deep in the swamps of Louisiana, Delilah’s face was marred forever at the hands of her sisters by the point of her mother’s kitchen knife. Despite her protest, her parents insist she make haste in finding a husband. But finding a husband isn’t an easy feat with a scar running the length of your face. 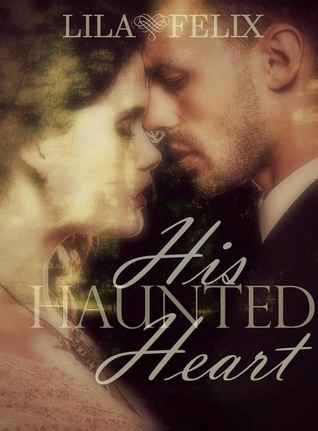 My Review: His Haunted Heart sort of threw me for a loop, this is not Lila Felix’s normal style. Honestly, I thought she was going to throw a twist in the story about halfway through, and it was going to be a little bit more “The Village” than historical. (Though I’m pretty sure she makes it pretty clear in the beginning its historical, I just choose to set aside that detail). I like to try and find foreshadowing while I’m reading – so I tend to look for things that aren’t quite there. What I Loved: There was just something about the melancholy setting of this book that drew me in from the very beginning. I was immediately rooting for Delilah, which is normal – you’re usually suppose to like the main character, but her life from the start just made me want her to have much better things. Truly all of the sub-characters were perfectly written, as well as being melancholy, I felt like the story had an air of ‘fairytale’ as well, so the ‘good’ characters were great, upstanding people while the ‘bad’ characters were obviously bad. I really enjoyed the chemistry between Delilah and Porter, their love and affection was pretty evident from the beginning. While there were some ups and downs, mostly on Delilah’s end – I kind of enjoyed that there was no major dividing line between them as a couple in the story. There wasn’t a huge falling out or major break in the relationship. They actually talked things out and there were even legitimate apologies for the way they behaved. I did like this for the simple fact that it breaks the norm when it comes to relationships in novels. It’s also worth noting that I am sooo thankful that this wasn’t a love triangle. I had about a three second time-span in which I thought it was going to be – but Lila quickly nipped that one! Not so Much: First of all, I felt like the ending was quite abrupt. It was like there is all this stuff, and then – done. So that was a little unsatisfying. It wasn’t in a cliff-hanger sort of way, but just a ‘…huh, that’s it…’ kind of scenario. I also felt like either we didn’t get enough correlation to things that seemed important in the story, and their purpose. There was a necklace, there was a lake, there was a witch-type person, there were ghosts and hidden backstories. There are the obvious facts which are laid out in the book, but throughout the story it felt like certain parts and scenes had much more significance, then when the “real story” or the mystery sort of unfolded I couldn’t decide if we were deceived and they weren’t really as significant as they seemed, or if I was just needing more detail – HOW was this used, what was the mechanics behind it. (My vagueness is purposeful to avoid spoilers). Rating: 3 Stars – I enjoyed this book!